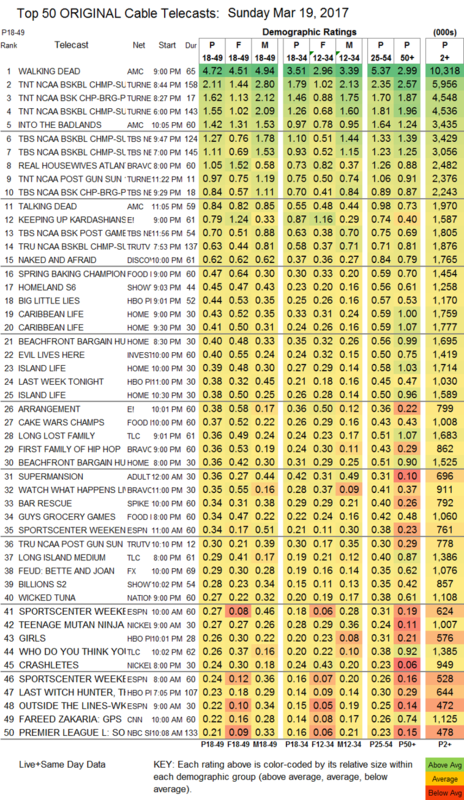 NETWORK FINALS: Despite the NCAA TOURNAMENT’s spillover into primetime, the only CBS adjustment was a 0.1 drop for NCIS: LA. Elsewhere, both the new and rerun episodes of LITTLE BIG SHOTS gained 0.1, and the rerun of BOB’S BURGERS lost 0.1. CABLE HIGHLIGHTS: On AMC, after THE WALKING DEAD dropped 0.16 to 4.72, INTO THE BADLANDS returned at 1.42. That’s a very solid number for cable, of course (and even for broadcast these days), but it represented a loss of 70% of its lead-in. When BADLANDS originally premiered in November 2015, it had a 3.15 rating after a 6.51 WALKING DEAD lead-in, a loss slightly higher than 50%. That’s not a great sign of audience enthusiasm, although we’ll know more in 3 weeks, when WALKING DEAD is done for the season. In 2015, after starting at that 3.15, it was down to 0.83 by its season finale without a WALKING DEAD lead-in. Elsewhere on AMC, TALKING DEAD (moved to 11:05PM to make room for BADLANDS) lost more than half of last week’s rating, down 0.91 to 0.84. On HBO, BIG LITTLE LIES climbed 0.08 to 0.44, LAST WEEK TONIGHT slipped 0.02 to 0.38, GIRLS fell 0.05 to 0.26, and CRASHING was down 0.06 to 0.11. On Showtime, HOMELAND ticked up to 0.45, and BILLIONS was down 0.03 to 0.28. On E!, THE ARRANGEMENT was up 0.06 to 0.38, after KEEPING UP WITH THE KARDASHIANS rose 0.09 to 0.79. Adult Swim’s SUPERMANSION fell a tenth to 0.36. FX’s FEUD stabilized after last week’s tumble, down 0.01 to 0.29. Hallmark’s WHEN CALLS THE HEART remained at 0.21. On Starz, BLACK SAILS fell 0.02 to 0.13, and THE MISSING was up 0.03 to 0.06/183K. The NCAA TOURNAMENT took up most of the night’s remaining non-AMC top slots, led by TNT’s South Carolina vs. Duke game at 2.11. More details about the weekend games can be found in this week’s Skedball post. Bravo’s REAL HOUSEWIVES OF ATLANTA still found a place in the Top 10, down 0.11 to 1.05, with lead-out FIRST FAMILY OF HIP-HOP down 0.08 to 0.36. 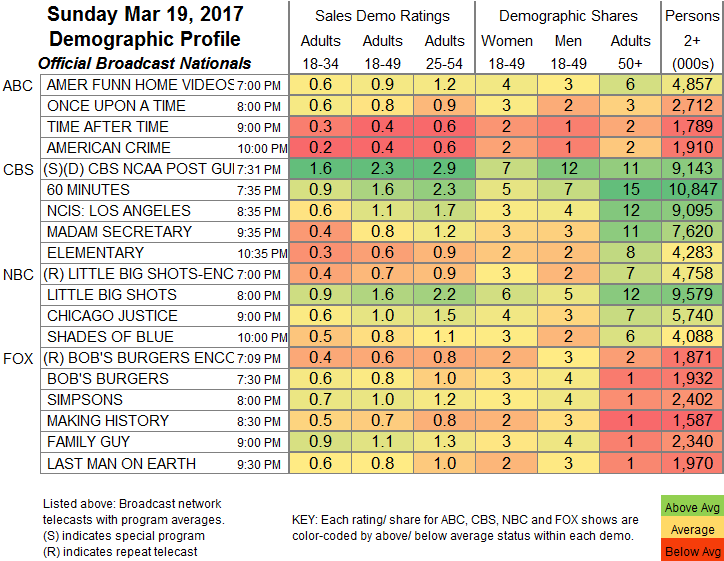 Discovery’s NAKED & AFRAID was steady at 0.62. On Food Network, SPRING BAKING CHAMPIONSHIP gained 0.03 to 0.47, CAKE WAR CHAMPIONSHIP arrived at 0.37, and GUY’S GROCERY GAMES ticked down to 0.34. TLC’s LONG LOST FAMILY rose 0.04 to 0.36, LONG ISLAND MEDIUM lost a tenth to 0.29, and WHO DO YOU THINK YOU ARE was up 0.02 to 0.26. Spike’s BAR RESCUE gained 0.02 to 0.34.